How can we tell it has been raining more than usual? The garden beds are lush. The only flower bed we have planted, a perennial bed full of natives, is way overcrowded for the first time. Every plant is jammed up and huge, in years past they have just not been large. Even after the cattle ate the oak leaf hydrangea down it has sprung back to life, full of buds that are ready to bloom! The vegetables have been thick and full. We know the heat will be here in full force in the next couple of weeks, and will be with us for about 8 weeks until things cool down a bit. There is usually scant rain during this time, and if a drought happens it is usually inside these 2 months. For now, the clover is in bloom all over the farm. Since this is pollinator week, I'm looking and observing the number of pollinators flying around and working our blooms. All I know is this: there are tons of them here. Every few feet in the clover, all over the buds on the flower beds, hanging out near tomato plants covered in blooms. The hive for the honey bees is buzzing and active, while the ground dwelling and more solitary bees are working every flower too. And then this! Mushrooms popping all over. Believe it or not: scientists know there is an underground system of something that is not roots of plants but roots of something else, and that when mushrooms sprout, all over, all at once, it is an indicator of healthy, life supporting soil. We have it here, no question. 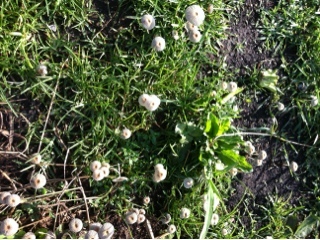 Each spring this one or two day phenomenon is larger than the year before, covers more ground with more varieties of mushrooms. They are here and gone quickly, and are sure signs that our soil is supporting many forms of life. I'm betting that this soil health helps all of the native ground dwelling bees. That somehow this flush of fungi signal those tiny, sensitive creatures that the soil here is good for them, and they make more and pollinate more. Earth systems fascinate me, as do the interconnections of healthy, fertile soil and the tiny creatures that fertilize so much.